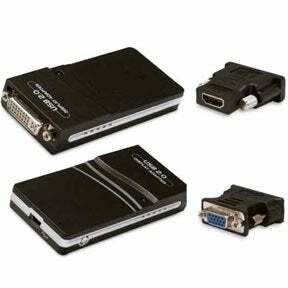 This USB Display Adapter enables you to onnect one more monitor; LCD or projector to a computer with a USB 2.0 port. For desktop users adding an extra monitor via USB connection is easier than ever without having to open the computer chassis to install an internal video card. Once the installation is done; the USB-attached monitor soon wakes up. No function key hassle to swap a second monitor. Eliminate the need for a traditional sound card with this USB to Audio adapter. Real USB plug & play to upgrade any on-board soundcard to 5.1 Digital Surround Sound without any hardware installation. Connect a speaker or headphone directly to the adapter and enjoy 3D positional sound and virtual 5.1ch sound track. Use the USB port power directly. Get this great adapter today. Video adapters facilitate the video connections on your devices. Quality video adapters are found at SF Cable. You can select one according to your needs and get them delivered at your doorsteps. Our range includes USB 2.0 DVI display adapter -HD, USB 2.0 VGA display adapters, USB 2.0 external video/ audio grabbers, USB 2.0 to audio adapter with microphone jacks, USB to audio & video capture adapter cables, multi-display USB 2.0 to DVI-VGA-HDMI adapter, and USB to video capture adapter cables. All our products are sourced from ISO 9001-2000 registered manufacturers and offered at very competitive prices. You are also offered commendable after sales service and lifetime technical support on all our products.